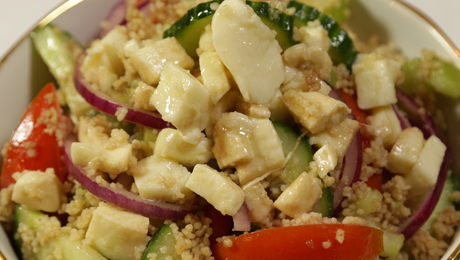 Place cous cous in a large bowl and pour in the vegetable stock. Cover with cling filmand leave until light and fluffy. In a bowl combine the chopped tomatoes, sliced cucumber, chopped celery, and sliced onion. Add the cous cous and top with cheese.